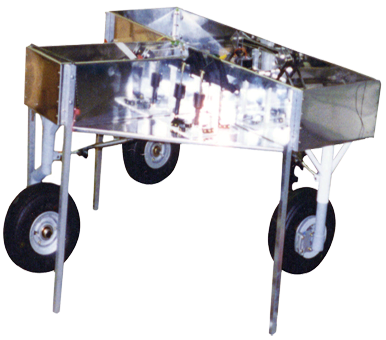 The Model AS-01 Tricycle Landing Gear Trainer can be used by students for hands-on training related to light aircraft landing gears. Shock strut disassembly and reassembly, and Hydraulic brakes inspection and maintenance. The Tricycle Landing Gear Trainer is fitted with actual aircraft parts that includes tires, tubes,wheels, dual Clevel and single-disc brakes,nose-wheel steering mechanism, brake pedals,dual brake-fluid reservoirs, master cylinders and hydraulic plumbing for the brakes. One of the three shock struts has a cutaway to expose the internal mechanism, while the other two are complete, and functional shock struts. The trainer is mounted on a frame with caster wheels for easy mobility. As an additional option, the trainer may be fitted with electrical actuators for retraction and extension operation (Model AS-01-E). The trainer is bundled with CBT covering the relevant topics, that explain the essential concepts in an easy-tounderstand explanation together with clear graphic and animations.